Please excuse my lack of posting. Lots of elements have combined lately that have decimated my desire to cook (and style & photograph & write witty notes about) anything worth posting here. I won’t bore you with the details, but I assure you there will be more recipes in the coming months. Please also excuse the mediocre photography. The lack of natural light at the moment is pretty depressing. However, what could cheer anyone up more than a whole lotta cheese and pasta? You hear lots of people call their dishes “grown up xyz”. Well, I’m going to be one of them. This truly is a grown up version of Mac & Cheese. If you can’t get your hands on truffle oil, don’t fret. It will still be tasty, but it won’t have the extra level of deliciousness that the foggy aroma of truffle provides. I made this after Thanksgiving when I had a random assortment of expensive cheese leftovers. They weren’t in good enough shape to serve on their own, but they certainly were delicious melted into this sauce. So technically this is a leftovers dish! There is likely many more to come as I use up the remainder of our holiday food in new and creative ways. Serves 4, or 2 generously with some for lunch the next day. I had already cooked the pasta at this point so it's not in the shot. I'm pretty sure you know what macaroni looks like. Random assortment of quality cheese. Make sure you have a soft goats cheese or tallegio, as this melts down into a lovely white creaminess. All up I think I had 2 grated or crumbled cups of cheese. You can add more or less depending on how cheesy you want it. Let your tastebuds be your guide. While it is boiling, in a deepish pan, melt the butter. 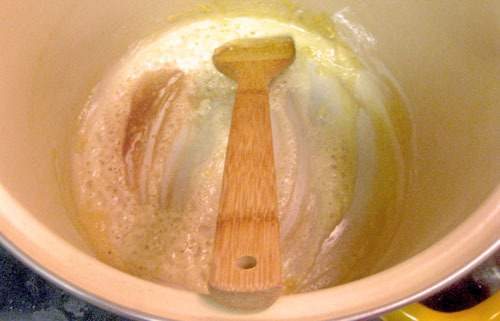 Stir in the flour and cook for a minute until you have a blonde paste, also known as a roux. Please note that mine began to colour, don’t do this. Add the milk bit by bit and whisk constantly while bringing it up to just-under-boiling. Please remember, don’t ever boil anything in this dish. If you see bubbles, first worry, then take it off the heat and whisk whisk whisk till it cools a touch. At this point your sauce should be very thick. This is commonly known as a basic bechamel sauce. Remember it, it’s a kitchen workhorse. Take off the heat and set aside, with the lid on. Drain the pasta when it’s done and set it aside too while you make the mushrooms. 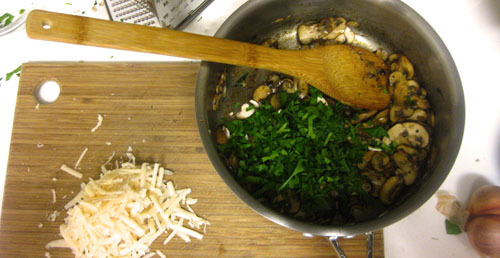 Heat a tablespoon of oil in a saute pan (this part is important, treat mushrooms like you would steak!) Add the mushrooms and cook on high until they start to wilt. Add a pinch of salt and cook until they are soft. Grind in some pepper and take them off the heat. Stir in the parsley and truffle oil and set aside somewhere warm. Bring the sauce back up to just-under-boiling. Remove from the heat and stir in the cheese until it’s just melted and incorporated into a smooth sauce. Season to taste – it shouldn’t need much, the cheese is quite salty. Stir in the pasta. 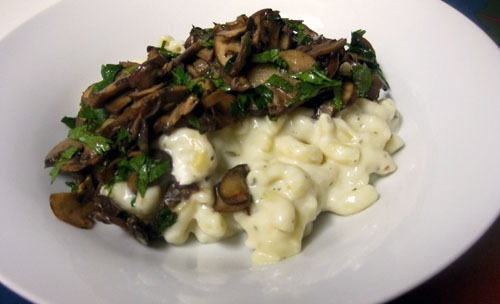 Serve in a warmed bowl topped generously with mushroom mixture. Enjoy the comfort of the familiarity Mac & Cheese offers, with some added aromas and finesse.